Workplace exposure: Respiratory sensitizers and Occupational asthma - Sentry Air Systems, Inc. The Occupational Safety and Health Administration (OSHA) sub-categorizes respiratory sensitizers within their Hazard Category based on weight of evidence on effects seen in either humans or study animals. Sub-category 1A – Substances showing a high frequency of occurrence in humans; or a probability of occurrence of a high sensitization rate in humans based on animal or other tests. Sub-category 1B – Substances showing a low to moderate frequency of occurrence in humans; or a probability of occurrence of a low to moderate sensitization rate in humans based on animal or other tests. Respiratory sensitizers encountered in the workplace have been known to cause occupational asthma among affected workers. Exposure to these agents will affect individual workers differently. Some workers may detect no side effects, some may find increased aggravation to existing allergies, and others may develop asthma-like symptoms for the very first time. While many workers find these symptoms to subside outside of work, they can range from mild irritation to life threatening. Mineral and inorganic dusts were cited as the most common exposure agent in WAA cases while diisocyanates exposure was more frequently reported in NOA cases. The services and manufacturing industrial categories together accounted for the majority of both WAA (62%) and NOA (75%) cases. In a book entitled Allergic Hypersensitivities Induced by Chemicals: Recommendations for Prevention, it lists low molecular weight respiratory allergens (Table 6-1) that possess electrophilic functionalities such as diisocyanates and acid anhydrides; functionalities that lend itself to becoming potential respiratory sensitizers. Many of these ingredients are found in common workplace applications such as enamel coatings, polyurethane foams, plasticizers, plastics, resins, pesticides, adhesives, disinfectants, and other industrial materials. Long term exposure or acute short-term exposure to these ingredients via inhalation may lead to respiratory sensitization and even occupational asthma. Without regulatory oversight, how are workers to protect themselves from respiratory sensitizers? A good first step is a comprehensive industrial hygiene plan that includes source capture fume extraction and air filtration. Some chemicals, when heated or evaporated, emit a nauseous odor that should not be inhaled. Whether you work with raw chemicals or solvents and epoxies comprised of several chemicals, it is important to have Safety Data Sheets (SDS/MSDS) on hand to evaluate each ingredient for their respiratory hazards. Working within a ventilated, filtered enclosure greatly reduces operator exposure to chemical fume. If a hood or enclosure does not support the application, then a source capture fume extractor is the next best option. By positioning a fume extractor close to the source of emission, fume and odors do not have a chance to escape into the ambient room air. Sentry Air Systems provides high quality air filtration solutions to customers in need of chemical fume control. We invite you to browse our website to see more about our products. 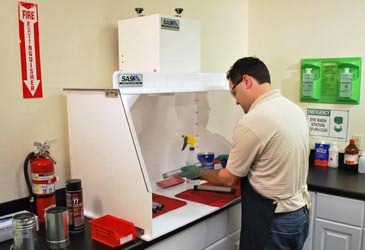 We also design and built custom fume hoods to meet customers’ needs. To view a sampling of our custom hoods, watch this short video on our YouTube channel. If your workplace is in need of source capture fume extraction please contact our technical sales specialists, they will work with you to determine the best solution. You can contact them at 800.799.4609, sales@sentryair.com, or by filling out the feedback form below. 3 Boverhof, et al. “Respiratory Sensitization and Allergy: Current Research Approaches and Needs.” Toxicology and Applied Pharmacology: 1-13. Access August 12, 2015. ftp://ftp.cdc.gov/pub/Documents/OEL/06.Dotson/References/Boverhork_2008.pdf.